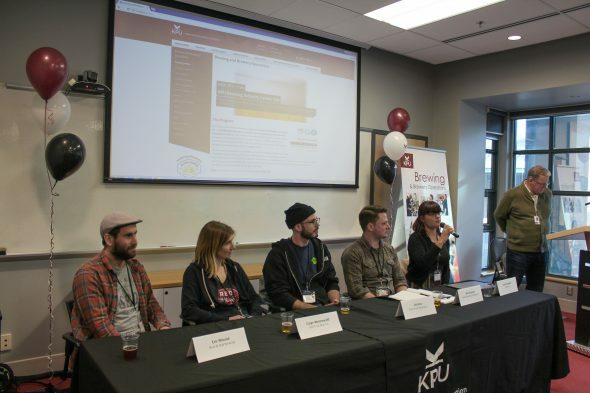 The third annual Brewing Career Fair was held at the KPU Langley campus on Feb. 26. Representatives from 22 breweries across the province were in attendance, including Four Winds Brewing, Parallel 49, Moody Ales, and Faculty Brewing. The fair was hosted by Ken Beatty, a brewing instructor in the program. The Helles Lager and Dubbel, two beers which were brewed by the first year students, were served at the event. Throughout the day, first and second year brewing students were able to participate in a “speed-dating” type of interview with three employers of their choosing. Each interview session was 20 minutes long and gave students the chance to learn about and apply to job openings available at local craft breweries. “It was a good opportunity to meet potential employers and kind of pick their brains a little about the industry,” says Jeffrey Bressette, a first-year student who was looking to secure a summer brewing position through the fair. Bressette also said that listening to how the breweries got started gave him a better idea of what to expect when he enters the industry after graduation. After the interviews, a question and answer period with a panel of industry experts took place. The panel included KPU Brewing alumni such as Ted Fine, who was part of the first cohort to graduate from the program. He currently works as a brewer at the Main Street Brewing Company in Vancouver. When asked whether the province has reached its saturation point for craft breweries, panel members agreed that there is still room for more in B.C. As consumers’ tastes are becoming more refined, more and more people are turning away from big beer brands like Molson Canadian and are instead spending their money on higher-quality product. In terms of making students more marketable, the panel advised them to obtain broader skill sets. For instance, certification in first aid and a forklift license would be valuable assets to employers, since craft breweries usually require employees to juggle multiple roles inside of their organizations. Another valuable piece of advice from the panel was for students to learn how to brew a good lager beer. They said that—although the beer world goes through different fads such as briefly favouring sour beers, saisons, and hazy IPAs—consumers always return to what they enjoy most, which is usually a clean tasting lager. KPU’s Brewing and Brewery Operations program was developed in partnership with brewing industry professionals. As a result, the students’ education reflects what the industry wants in its employees. KPU’s annual brewing fair connects breweries with students, allowing craft breweries to benefit from the talent they helped to educate.